These pomegranate chocolate chunk oatmeal cookies from Hidden Ponies are a unique take on the classic oatmeal cookie. The pomegranate seeds add a burst of tartness to the cookie while the oatmeal adds texture and the chocolate adds richness. The best way to de-seed a pomegranate aside from just buying the seeds themselves is to remove them in a bowl of water. This way you will keep your kitchen clean and your clothes unstained. 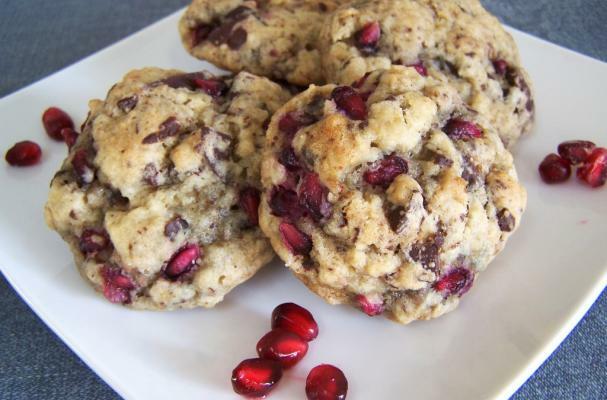 Pomegranate chocolate chunk oatmeal cookies are a delicious o start to 2012.